Just tried it out and it looks cool! I really love the old style and missed it. Just stumbled across this topic and tried it. Thank you very much! And i found a bug. If i search, the highlighted keyword is only visible when marking it. It has same foreground like background I suspect. Screenshot attached. Maybe you'll fix this. Anyway, thanks again. I think having this dark space theme is a great idea, because that's how WinWorld always looked, ever since the beginning. Maybe you could find a way to add stars in the background as well. @sdose, thanks for pointing that out. There were a few other bugs I wanted to fix anyways. @JonathonWyble, I haven't updated the screenshot yet, but the starry background is in the header. Nice to see that you're still around and still interested in your project. I use github for "long-term-storage" and pushing me to "make-things-right-before-publishing" and from there I know far too much abandoned projects. 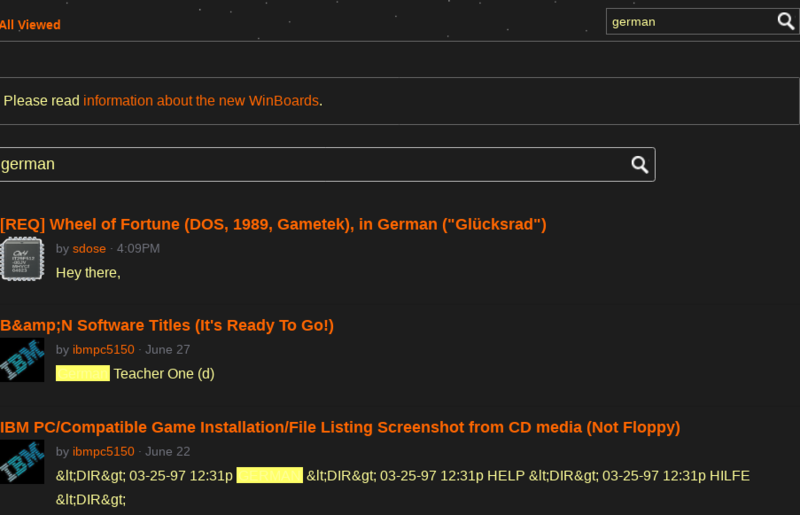 However, one disadvantage of the dark space theme is that it used to sometimes make me a little nauseous, going from the WinWorld tab to a tab with a white layout. This was prior to the reset in 2017, way before I had my WinWorld account, but I did use the site to download stuff at that time. I've moved this into Announcements and stickied it, so it's not buried in the Programming forum. Cheers and keep up the excelent work lad. I missed the classic old dark-orange style aswell. Thanks man.